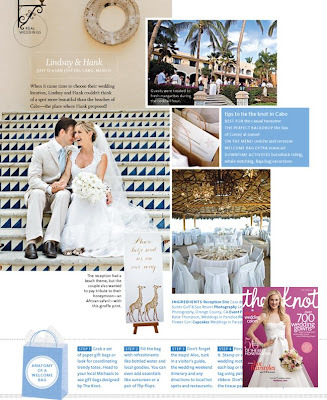 I have had weddings featured on the Knot website, on Oxygen channel’s Platinum Weddings and in several other bridal magazines, but this is a first for me…to have a wedding featured in the Destination Wedding portion of Knot magazine. I’m thrilled and a huge thanks to photographer, Leigh Miller, who submitted it. She also was sweet enough to send me a copy of the article so I could share it on my blog. This was truly a LOVELY wedding, at Casa del Mar in Cabo San Lucas. Magazine available now at your local bookstore!